Well, Cambodia...bit of an experience! Started out with the bumpiest bus ride known to man. Sore arse doesnt even come close and leg room??? Whats that?! My regular work sitting position of knees up close the the chest was a necessity for any comfort. Anyhow I did manage to sleep through some of it, the rest was spent taking in the sparce countryside rife with poverty and dried out mud flats. Quite a site in comparison to Bangkok. 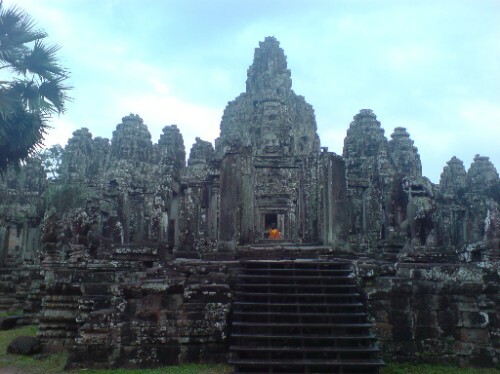 We arrived in Siem Reap close to the Ankor Wat ruins, only to have someone trying to con us into getting another room to stay in (we'd already paid for ours) but blonde I may be, stupid Im not so we carried on as we were and got to our place which was run by an english guy. Was pretty basic, but he was really helpful. After 4 hrs sleep we went off in a tuk tuk for the day to the ruins. Went to see the sun rise over the ruins which is amazing, except it started to pour down torrentially just before sunrise was due and due to thick clouds it never happened! Gutted! It carried on raining for a while and we saw all the sites. Was still a great place to go and so glad we did it. Mind you we nearly passed out with hunger and exhaustion. Walked up some steps to the top of a temple and when it came to going back down again we realised how steep it was. Came back down on my bum for safety, didnt fancy killing myself at a religious site. Next day was the long old bus journey back, but we felt we'd had long enough over there as the town was limited with things to do. Got a vid of the bumpy journey and loads of pics so will post then shortly when we find a place to upload the photos. Definately reccommend it unless you have chronic back pain (me) long legs (me) and get travel sick (me)! !